As I learned at the Copper Canyon of Mexico, not all the best travel experiences involve breath-taking adventures, cultural lessons and deep understanding. Sometimes the best ones are small, intimate, and almost silent. Sometimes they don’t involve people at all… but you can have a party just the same. I flopped onto the bed and kicked off my shoes. It was quiet here, blessedly quiet. No sound but the breeze whispering through pine needles, then scurrying down into the depths of the great canyon below. Las Barrancas del Cobre, Mexico’s fabled Copper Canyon—it plunged below me in more shades of green and gray and rust and yellow than I had words in Spanish. The sun was low, tinting the shadows in the hollows the deep coppery bronze that gives this giant snaking hole in the ground its name. 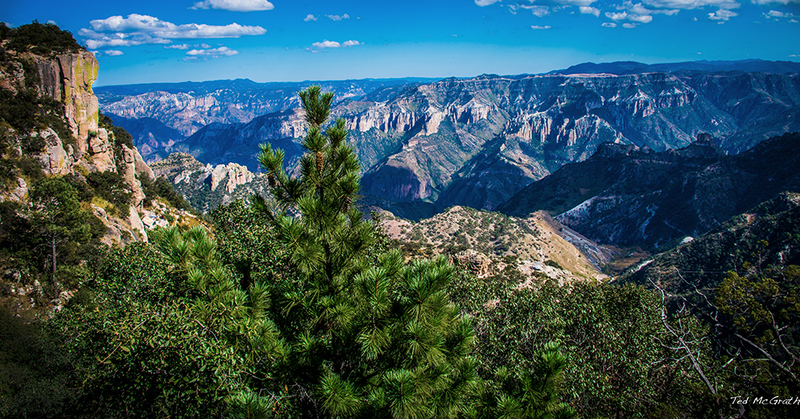 View of Urique Canyon, part of Las Barrancas del Cobre, Mexico’s Copper Canyon, in the state of Chihuahua. But I was tired after a long day—though hopefully my passengers were not. As a professional Tour Director, my job was to make their days effortless, exciting, relaxing, adventurous, full of new sights and sounds and information but not over-full, not overwhelming. Name your vacational dream; my job was to provide it. And I was good at it. But creating all that effortless-looking magic could sometimes be a slog. As a Tour Director you are Social Director, Logistics Manager, Entertainer, Teacher, Emergency Tech, Problem-Solver and Explainer-in-Chief. Also hand-holder and sometime baby-sitter. At the end of the day, your passengers head off to enjoy the bar and the mariachi music and watch the hummingbirds lured by the red-siren sparkle of the feeders hanging on the balcony over the canyon’s edge. And all you want to do is leave them to it. Hide in your hotel room. Have a hot shower. Read a book. Enjoy the silence. Be alone. Or at least that’s what I thought I wanted that night. I really did. The Hotel Mirador Posada Barrancas is perched directly on the edge of the massive hole that is the Copper Canyon. You can step onto the balcony of your room and look down on the birds flying below. This night it was chock full. I had a good-sized group on my tour and we were not the only bus-load in the hotel. The dramatic beauty of the Copper Canyon and its iconic train ride made for a popular tour, and every room in the main building was full. The owners, the Balderrama hotel chain, were building a new wing, way at the top of the property. They called it El Nido del Aguila, the Eagle’s Nest. To get to it, you took a long stone path and stairs that snaked through madron trees, sotol cactus and the long-needled Arizona pines the Tarahumara people use to make their lovely baskets. Hotel Mirador Posada Barrancas perches right on the cliff edge of the Copper Canyon in Mexico. The “Eagle’s Nest” eyrie at the top was just being built at the time of our story. I was in the first room on the right, likely the first guest in it. I finally reached my lovely, quiet, blessedly isolated room. There was no phone. No TV. No radio, no cell signal, no internet connection. The light smell of fresh paint jousted with the sharp tang of the pines edging the balcony beyond a pair of sliding glass doors. There were no other guests in the new, partially built eyrie. I could taste the aloneness and it was delicious on my tongue. The main building may have been full to the brim with merry-making and margarita-slugging tourists, but up here it was completely and utterly quiet, or at least quiet of human sounds. The best kind of quiet when you spend your day shepherding a few dozen people from point A to Point B, smiling all the while. It wasn’t really cold enough for a fire, but I was pining for the scent and the crackle and yellow flames to stare into mindlessly. An armload of pine logs and splinters for kindling from outside my door soon had the carved stone chimenea singing its fiery song. I slid open the balcony doors to let in the soft evening air. A long hot shower, a silent sit before the leaping flames restored my soul. I lay on the new bed, listening to the crackle of the fire and the overlaying silence. I ate a cracker, enjoying the bite of salt on my tongue. I reveled in the mundanity of it all. Such rare peace, to be savored in the mouth, mind and muscles. I grabbed the book I seldom had the peace to read. After maybe a half hour with it, something made me glance right, at the lamp on the bedside table. That’s when I discovered I was not actually alone. There on the lampshade was a pale brown praying mantis, poised in perfect elegance, head up and face turned toward me. The creature was at least three inches long (about 7.5 cm). His big, calabata-olive eyes were perhaps two feet away, yet he paid me no attention at all. He seemed neither impressed nor bothered by my presence and proximity. He just perched there preening, cleaning his long feelers exactly as if he were a cat. One long beige leg came up, the end hooked itself around a feeler and pulled it down in an arc. Then beginning at the head end and moving methodically toward the outer tip, he passed it slowly through his mouth, cleaning each tiny section as it went. That done, he picked up the other delicate front leg, reached up for the other feeler and repeated the process. Then back to the first. My book lay forgotten as I sat fascinated by the mantis’ performance. I forgot the scent and beauty and depth of the Copper Canyon just outside the sliding doors. I moved as close as I thought I could. He never flinched. I edged a little closer. Any closer and I would not have been able to focus. He was less than a foot beyond my nose. It might have been ten minutes I watched him, or maybe thirty. I was lost to time, absorbed by the elegance of his movements and the perfection of every part of him. 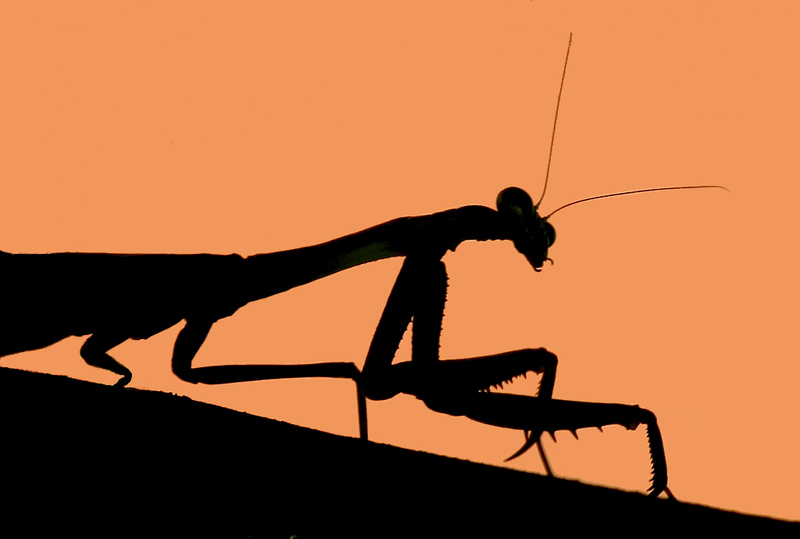 But finally, I did roll away and refocus on my book, leaving the mantis to his prayers and ablutions. Another chapter read and I glanced back to the lampshade to check on my guest. He was not there. I panicked for a moment, though I don’t know why. He was better suited to this place than I was. But I was worried, so I knelt on the mattress and peered over the headboard and down along and behind the nightstand looking for my pretty new friend. He was nowhere to be seen. But… there on the floor, just sticking out from under the nightstand, was a minuscule pink nose. It twitched. Then it froze. I moved a fraction and it disappeared. But I had seen enough to recognize a tiny gray mouse. 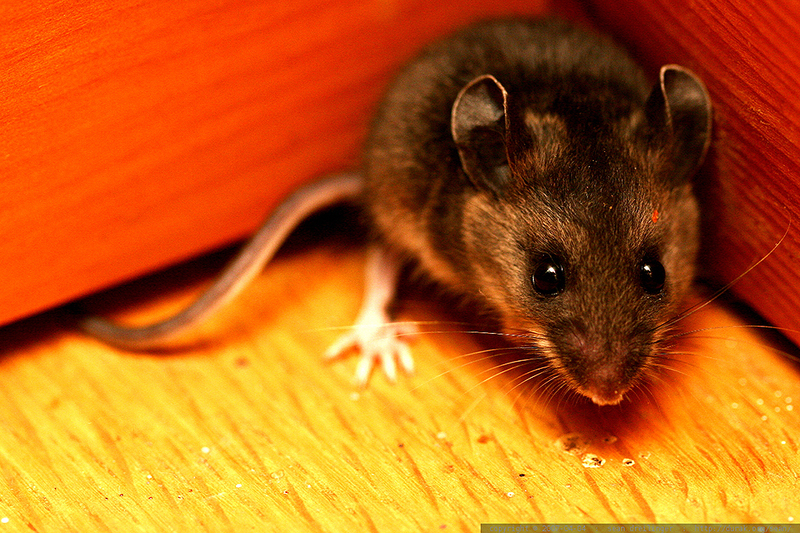 A tiny wee mouse came out to say a timid hello. I fed him cracker crumbs. On a whim and a hope, I broke off a piece of cracker, crumbled it and dropped it on the floor where the nose peek had been. Then I lay down, hanging crosswise off the edge of the bed, and waited. It took a few minutes. But I think the little guy was hungry. Pretty soon, the nose appeared again, all quivering pink and twitching whiskers. The little lad then darted out from safety, all one-inch-plus of him, grabbed the cracker pieces and darted back to safety again. “Would you like some more?” I asked politely. “I have plenty.” I crumbled another cracker, dropped it in place and waited. Out he popped, grabbed, scurried back. We continued the game awhile. I wondered what he was doing with all the crumbs, which must be piling up faster than he could eat them. Perhaps he was a she with a nest of babies clamoring for cracker feedings. I was afraid if I got down to look I would scare her off, and I was enjoying the company. The praying mantis perched on the headboard behind me, like he was tying to read over my shoulder. Eventually I unfolded myself and turned back to my book… only to discover the preacher was back. Praying earnestly just above me, or perhaps studying my book, was the mantis, his delicate body perfectly arched atop the headboard behind me. I wished my book was a field guide to the trees and wildflowers of the Copper Canyon so he could enjoy reading over my shoulder. It was most likely a trashy historical romance novel, but he didn’t seem to mind. I settled down to read, enjoying the feeling of having companions around me. As the evening wore on and the air got chillier, my feet grew cold. I got up to retrieve some socks from my suitcase, lying on the terra cotta floor. There I startled guest number three to the party in room 101. As I reached into the bag, a wee frog, greeny-brown and no bigger than a gumdrop, hopped out and across the room, stopping only when leap met wall. A shy and tiny wee frog. “Hoppy” seemed less inclined to be friends than my prayerful insect companion or even Ms. Mouse. He trembled a bit, cornered as he was. I retreated a safe distance to give him a little confidence and watched him. I had no froggy equivalent of crackers to offer and lull him from his fright. Full night had fallen. The fire had burned down to embers. 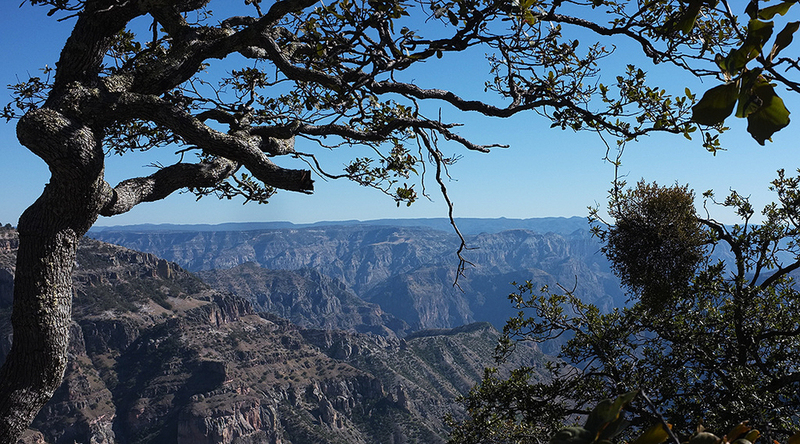 The subtle sounds of the Copper Canyon had quietened to almost nothing. And tomorrow morning, my passengers would expect me to be “on” and ready—to answer every question, solve every crisis and make sure they got what they had paid for. It was time for everyone to sleep. I reluctantly turned off the light, tucked my sock-clad feet under me and snuggled down into my brand-new mattress. I’d left the drapes open to the wide swath of canyon. The sun awakened me with a wink, then a laser, first peeping then pouring over the edge of the canyon’s horizon and straight into my room. I felt more refreshed than I ever feel on tour mornings. Stretching, I looked around the room. There were no visible remains of the party we had held the night before, no bottles or empty cups, no party hats or stretched out streamers. And no guests. I looked all around. The mantis was nowhere to be found. Perhaps he had a lady friend further down the slopes of the mighty Copper Canyon. Perhaps he had been preening the night before just for her, wanting to impress. The frog in the corner had used the cover of darkness to hop off to safety. And Ms. Mouse was who knows where? The mini-menagerie had all gone home, wherever home was, and I was alone again. But there was evidence if you looked hard enough. There was proof of our revels. On hands and knees, forehead to the floor, I peered under the night stand, wondering if Ms. Mouse was still there. No mouse and no babies either. But there, in at least a dozen neat little mounds, like miniature haystacks, were heaps of cracker crumbs, precisely spaced, awaiting her return. 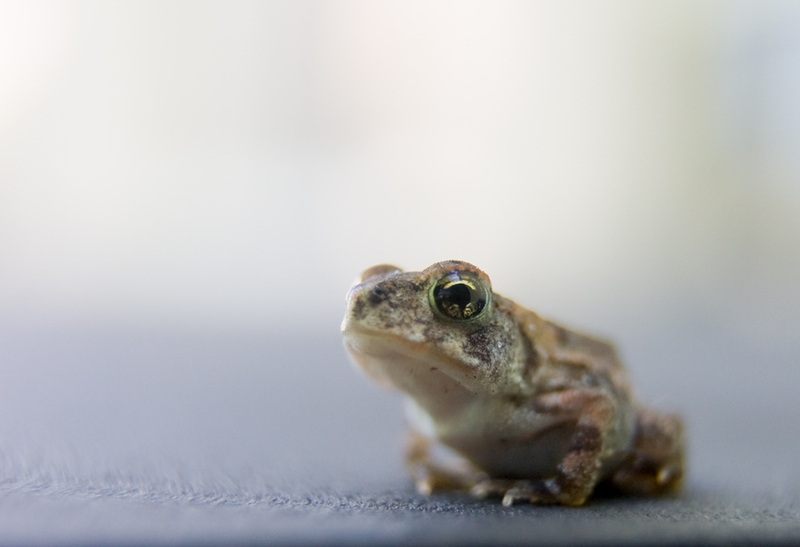 I checked my suitcase once more for stray amphibians then closed it and set it outside the door for pick-up. I headed back down the long stone path and stairway, lured by the faint smell of coffee wisping up from the hotel dining room. It was time to show my passengers more of the wonders and glory of Mexico’s Copper Canyon, four times bigger than the Grand Canyon, to introduce them to some of the Tarahumara Indians who lived there, tell them the names of the plants and the trees and the rocks. But I decided I would not tell them about the party I’d held in my room the night before. I didn’t want to make them feel left out. Late afternoon at the beautiful Copper Canyon of Mexico. 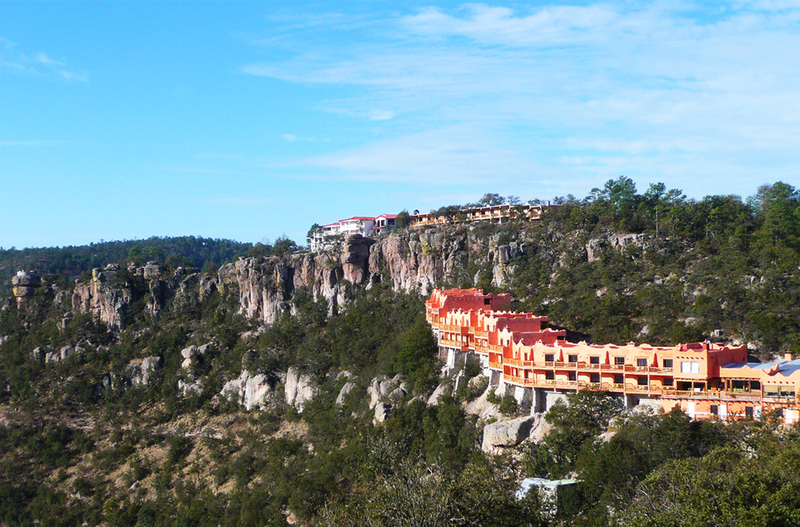 Get more information about the Hotel Mirador Posada Barrancas at the Copper Canyon in Mexico. You might have been in a digital black hole, but what guests to have with you! Nice photo. Bringing something in the foreground, like trees, into the picture gives the picture a sense of scale, humanizes it and highlights detail while at the same time emphasizing the vista beyond. And I like trees. Also, digital media is more amenable to detail enhancement. Shooting this on film would be more difficult. Very nice! A praying mantus AND a mouse?! I would have absolutely freaked out!!!! Well, I knew the praying mantis would not bite or sting me. And the mouse was all of 1 1/2′ long! I could have swatted him ike a bug if I’d wanted. I just enjoyed them instead. But… I never mentioned them to my passengers! What a great story of your eventful time in Copper Canyon. I don’t know if I would have appreciated your party companions the same way. At the first sighting, I probably would have escaped to the bar for mariachi music with the rest of the group. But I’m glad you didn’t so that we could have this story to enjoy. HaHa, thanks Cathy. They didn’t bother me. Probably because I was just so fascinated by that mantis’ preening. And I’d already had a margarita before dinner! Sometimes such little “friends” can be more entertaining and less whining about trivial things. After finishing your story, I agree that the simplest parts of life should not be missed. Although knowing a mouse might scamper across my bed would make a few margaritas be needed. I love the way you told this story. I’m not sure I would have invited these guests to party with me, especially the mouse, but it sounds like a fun evening. Thanks, Donna. It was one of the most pleasant evenings I had the whole time I worked as a Tour Director! What a wonderful story. I was “on the edge of my seat,” so to speak, wondering who would show up next and how your would greet them. Your little party was certainly nicer than many I’ve been to!! Thanks, Marilyn. Your comment made me chuckle out loud. 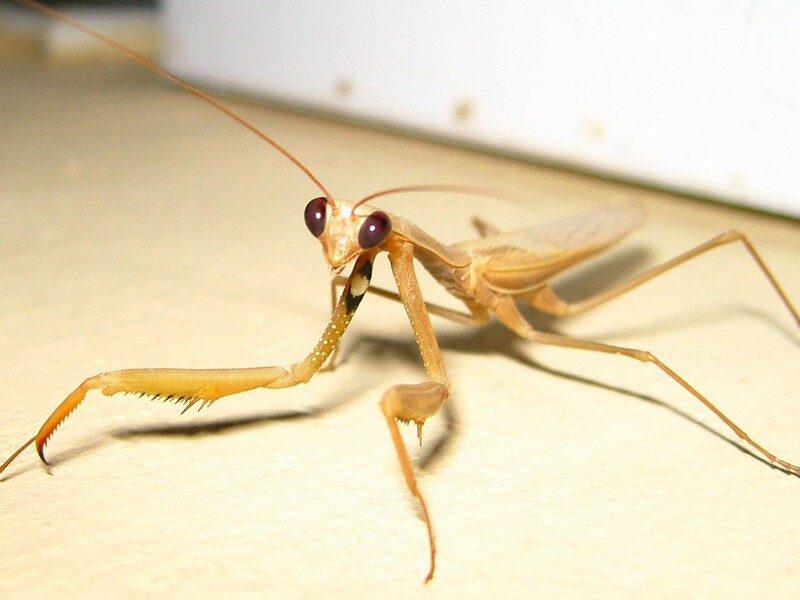 The mantis looks like an alien. Not sure if I would appreciate the company. But the pics are great as well as the story. THanks Cristina, glad you enjoyed it. I did not mind their company at all. I relished it. No demands, no chatter, no criticisms and no emergencies–the usual life of a Tour Director!